There are two types of sail, the early type of plain canvas sail stretched over a wooden frame called a Common Sail (above left and right), and the Patented Sail that consist of a series of wooden shuttered slats (above centre). Common Sails were cheaper yet more labour intensive to set. 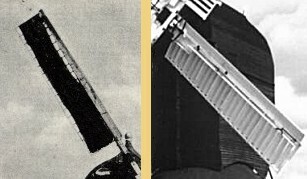 Patented Sails could set via a set of levers; a development of this was a device called a spider that fitted over the canister box and this allowed all of the Sails to be adjusted at once. By all indications Wheatley mill was never that profitable so when it was originally fitted with Common sails these were never upgraded. In fact for most of its working life the mill only had two of its original sails. This again wasn't an uncommon occurrence as the mill could function adequately with just two sails. So when a pair of the original sails was damaged, say by a storm, the miller would have them removed rather than going to the expense of replacing them.